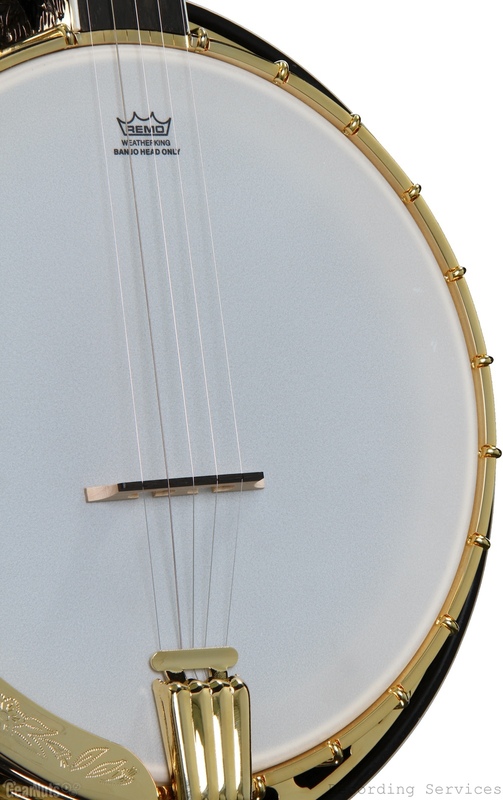 Washburn has been making banjos since the 1880s, and the Washburn B17 5-string banjo is the culmination of all that experience poured into a single instrument. Its flame maple resonator back gives you the volume and projection you need to be heard in any setting. A smooth-playing maple neck with a bound ebony fretboard is effortless to play from the first fret to the last fret. The genuine Remo head combined with the ebony-topped maple bridge deliver the bright and punchy sound you want. When you want killer banjo tones with premium appointments, the Washburn B17 resonator-backed 5-string banjo is the instrument you need. Thanks to the use of traditional tonewoods and design, the Washburn B17 5-string banjo gives you the punchy, plucky banjo sound you want. The flame maple resonator not only looks good but increases the volume and projection of your banjo. Let your fingers fly across the bound ebony fretboard and comfortable maple neck. The resonator-backed Washburn B17 5-string banjo gives you great tone and feel at an affordable price. If you want that traditional bluegrass sound, then you want a banjo with a resonator. The Washburn B17's flame maple resonator gives you a brighter tone and great projection associated with bluegrass. Combine this with the Remo head and the ebony-topped maple bridge, and you have an instrument ready for any gig or jam session. The bell brass tone ring gives your sound extra punch, volume, and tone. Quality planetary tuners give you rock-solid tuning every time. With humble beginnings in Chicago dating back to the 1880s, Washburn is an American institution in musical instrument manufacturing. From guitars to mandolins, banjos, ukuleles, and more, Washburn has long been a recognized and cherished brand among musicians. Many of the biggest names in folk, blues, and rock 'n' roll have played these well-crafted, quality instruments. Washburn combines quality construction with premium materials to deliver an instrument that's ready to perform on any stage. Call your Sweetwater Sales Engineer to find out more about this iconic brand.